Our executive-style mountain home features four bedrooms, with queen beds, and three bathrooms, each with double vanities and tub/shower combinations. The lake and mountain range views from the master bedroom and both decks are truly unbelievable, some of the best that Bear Paw offers. The main floor level has solid oak hardwood floors, and soaring tongue and groove pine ceilings. This level features an open great room, a dining room, a stacked rock gas fireplace, a 32 inch LCD flat panel television with surround sound, a VCR/DVD combo, a fully-equipped kitchen with solid surface countertops and sink, raised panel oak kitchen cabinets, two bedrooms, and a full bath. This floor leads to two decks, one covered with a 6 foot cedar swing and one open. The view of the lake and mountains from both of these decks is fantastic!! The upper level has a master suite with solid oak hardwood floors, a television, a DVD player and a separate sitting area that overlooks the great room below and the fantastic view of the lake and mountains through the wall of windows. This master bedroom also has a full bath. The lower level has a bedroom, a living room with a television, a DVD player, a full bathroom, a full-size washer and dryer, and a deck, with a 5 foot swing. It offers views of the lake and mountains. Our home is located in Bear Paw, which is the only development on gorgeous Lake Hiwassee in the mountains of southwestern North Carolina. Lake Hiwassee is only five to ten minutes walking distance from our home. Lake Hiwassee is an 18-mile long mountain lake that offers casual fishing, boating, and swimming. There is also a shared swimming pool (open from Memorial Day through Labor Day, a marina that rents boats, a tennis court, a basketball court, a child's playground, and a child's fishing pond. A secured entrance gate adds to the feeling of peace and serenity pervading Bear Paw. PLEASE NO SMOKING INSIDE THE HOUSE AND NO PETS ARE ALLOWED!!!!! We are residents of Tallahassee, Florida, and are retired high-school teachers. 2016 marks our 47th wedding anniversary! We have two children who also live in Tallahassee and four grandchildren, two of whom live close to us. We enjoy visiting our rentals in Boston, MA , Nashville, TN, and in Bear Paw near Murphy, NC, but we also enjoy sharing the fun with you. We have many repeat renters who have become friends to us. We keep our rentals clean, well-furnished and updated for your enjoyment. We had vacationed in Bear Paw several times and enjoyed the area a great deal. It is in a gated community near Murphy, and has beautiful views. We liked the fact that there is an olympic-sized swimming pool, tennis court and basketball courts to provide entertainment. Our children, who are grown now but were young at the time we built our first house in Bear Paw, absolutely loved to go there. Since the area has rentals and permanent homes, we did not feel like we were tourists; we felt at home. We like swimming and fishing on the lake as well as boating. The swimming pool and playground are nice for the little ones. It is such a peaceful place. If you want activities, there are plenty around, but if you want peace and quiet, Bear Paw is hard to beat. The view of Lake Hiwassee is Fantastic!! There is an almost 180 degree view of the Smokey Mountains!Absolutely gorgeous. There are post cards for sale in Murphy and the view is almost exactly like ours. They must have been standing on our deck, although we didn't ask questions about how they got that view! It is amazing! (3) Upper master Br, main floor living room, and lower floor living room has Direct Tv! A few; our satellite has music stations. Limited, but we do have some. Seating area for quiet reading with lounge chair is located outside the master bedroom. 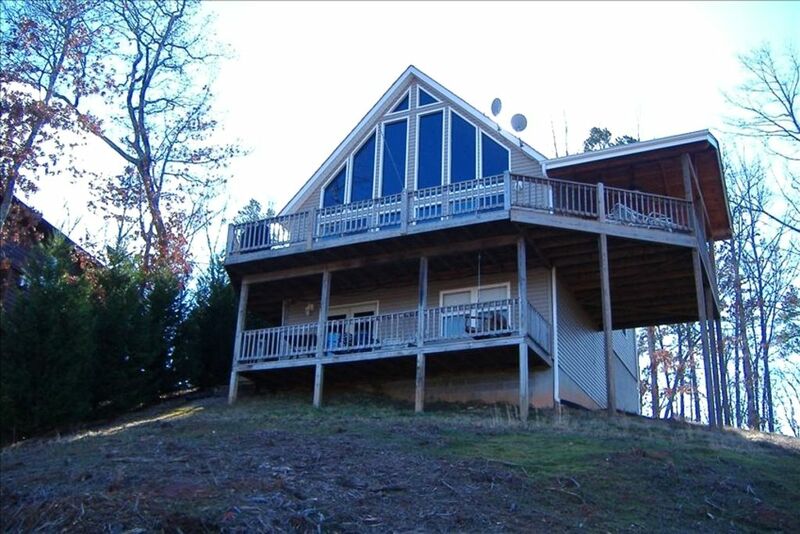 Home has deck off the main floor, covered porch off the main floor, and a deck off the lower level floor! Porch swings and patio furniture on both levels. Satellite TV'S(3), VCR'S(2), DVD/VCR Combo, Pool, Gas BBQ, NO SMOKING INSIDE HOME! Flea Markets, Whitewater Rafting, Gold Panning, Ping Pong Table.